Have you been looking for answers to lettuce gardening questions that I haven’t answered on this site? How about any other aspects of growing lettuce? I a curious to know how much leaf lettuce to grow. My husband and I are a raw vegan household and eat about 12-15 cups of leaf lettuce daily total. Please, how many plants should we put in the ground to get the yeild we desire? Thank you for your help. Sorry, I’m not ignoring you. I’m not really sure with this one. I was hoping someone else would chime in with an estimate. I am in Cottonwood Az can lettuce be grown as temps soon will be 50 to80 or even 90? It might be too late already for lettuce in Arizona. I found this article for you, which has a good link to a page about planting times for Arizona. Lettuce has a shallow root system and seems to do well in window boxes. Lettuce grows quickly, so you’ve got a short time before harvest. Keep in mind that gardening outside depends on soil temperatures. When gardening indoors, you’re eliminating a lot of your outdoor variables so it’s less restrictive when it comes to growing seasons. Part of being a beginning grower is experimenting with your growing environment: sunlight, containers, and even soil medium. Your window box should be fine for drainage, just make sure you use a light soil mixture that will allow the soil to drain. Good luck, and enjoy your greens! Hi, My question is about lettuce diseases, I think. Lettuce in our greenhouse is rotting in the centers of the heads of romaine and now crisphead. Its a solar greenhouse, 5′ x 22′ raised planting bed. Letely the weather has been warm so the door and windows are all open, daytime temps around 70 – 80. I water with a hose on the soil surface, not overhead. Yesterday I watered, and today the crisphead is rotting. Perhaps its a watering style issue, but its not shown up in the crisphead before. The plants are 4 – 6 weeks old. There is a 2′ fan running in there all the time. I appreciate your website here, but would like more symptoms included in the disease section, maybe pictures if you can find them ? Check into bottom and drop rot. It’s pretty common for lettuce, especially in greenhouses. Bottom rot usually starts on the lower leaves. It then moves to the stem, and eventually the whole lettuce plant. Soil fungi cause these rots. The first suggestion is not to water overhead, which you are doing. Have you recently fertilized? Sometimes, too much fertilizer can be linked to the problem. Try compost as a gentle fertilizer for lettuces. Also, make sure the soil in your raised planting bed is draining well. Compost will help your soil retain the appropriate amount of water with the organic matter absorbing the excess, keeping soil moist but also away from the lettuce. Here’s more information on greenhouse lettuce diseases from the University of Connecticut: http://www.hort.uconn.edu/ipm/veg/htms/lettuce.htm. height they “go to seed”, I am told. Can the seeds be planted or should I just pull up the plant because it’s growth is done. I have butter leaf lettuce . Yes, you can harvest these seeds and replant. So, let them finish out their growing cycle, “go to seed” and replant. I am growing leaf lettuce in a pot, and it’s doing just fine but it tastes a bit bitter. I have used organic garden soil and organic veggie food. What else can I do to make it less bitter? Weather that is too hot, and too much nitrogen fertilizer can both cause bitter lettuce. You might try backing off on the plant food if hot weather isn’t your issue. My Boston lettuce looks great one day and then the next day it starts to wilt and the lower leaves turn yellow-green, then if I tug on the pant a tiny bit to remove those dying leaves, the whole lettuce plant comes up and the root is brown and mushy where it breaks off, sometimes I see a brown centipede like worm wriggle into the dirt. It has been systematically killing my plants one by one. Help! Do you think it’s a cutworm? Sometimes a fungicide can help with that. I am growing head lattuce in my raised garden. We noticed that lately the older leaves are turning brown. The heads seem to be forming, but this is my first time growing them. Should I pull the dead leaves and continue to let them grow, or is this a sign of loosing the entire plant. It is early enough in the season to replace them with something else if necessary. Hi there, I was just wondering about growing lettuce in pots? Are there certain varieties that do better than another in pots? Is there a specific depth the pots should be in order to grow? Thanks a lot! Hello. I really am interested in growing lettuce in Ft. Lauderdale. After researching, I feel like I missed my window to plant and that it’s too hot in south Florida. What do you think? Yes, it’s too late for Florida. But fall is just around the corner! I live in an apartment and am going to be experimenting with growing a few vegetables this Fall. With a very limited amount of space, I’d like to maximize the variety of vegetables I’d like to grow. What is the smallest lettuce plant that you know of? For someone who doesn’t eat a lot of cold salads, would only a couple plants be enough for, say a side salad 3 times a week for 2 people? 1. Have you considered the Aerogrow? It’s an easy way to grow lettuce inside the house. It doesn’t take up much room, and it would easily grow enough lettuce for you throughout the year. 3. I’m not convinced that growing smaller lettuce plants would be the key to success, so I’m not sure if I’d focus on that as your solution and would instead try and determine how many plants you think you might need in general. Even if you get a little bit more lettuce than you need, that would be better than not getting enough to use. Good morning!!!! I cut my lettuce this morning and noticed this milky substance in the stalks…do you know what that is?? This is my first time trying to grow lettuce. It also is very bitter to me. We live in North Carolina, don’t know if that matters or not. That’s normal, so you shouldn’t worry. If your lettuce is bitter, it might be from hot weather, too much nitrogen fertilizer (or sometimes not enough), or inconsistent watering. If you put your lettuce leaves in the refrigerator for a day or two, it will reduce the bitterness. Great site… thanks!!! This is my first year growing lettuce in our garden (Barrie, Ontario) so any advice is appreciated. Earlier I harvested by using outer tough leaves as compost and eating the inner softer leaves. Unfortunately, now each plant (12 in total) are trying to go to seed, should I now cut each plants off at the stem? Thanks for the tips. Hello, I now work on an Organic farm, this is our first year. we have a small lettuce feild that is doing very well & we had our first harvest yeaterday , it was beautiful … but only for a few hrs. the lettuce was wilted by that afternoon 🙁 do you have a link or any info on how to keep it looking beautiful for a couple days after it is cut??? Our “iceberg” lettuce is now about 2 1/2 tall and going to seed without every producing any heads. What did we do wrong? There were no instructions on the package about pruning to force heads — just said it would form “loose heads”. I have a question, I am growing bibb lettuce and one of the things that is happening is that I am seeing stocks on a few and others are starting to fill out and get fat leaves, but do I need to prune the stocks? I have relocated the lettuce to a cooler place so that way they stay away from so much sun and that caused the stocks to grow (I think) Im just not sure what to do. And for those that have limited space like I do, get the same storage tubs that you use for the stuff that you own, cut holes in the bottom add river rock and then dirt, you you have a garden. I would have included pics but not sure how. I planted loose leaf lettuce seeds at the beginning of February, here in sunny southern California. The information I have says the lettuce should begin to be ready for harvest between now and the end of this month, but of the plants present, the largest one is only the diameter of a small orange (the smallest is only the diameter of golf ball!). What could I be doing wrong that has prevent the lettuce from growing properly? Or is it possible they will suddenly develop over the next 2 weeks? I’m having the same problem as Jezz! I’m not 100% but could it be the temp and moisture levels in the air? I’m gonna try a harvest today and its cool and rainy so hopeing that will help! 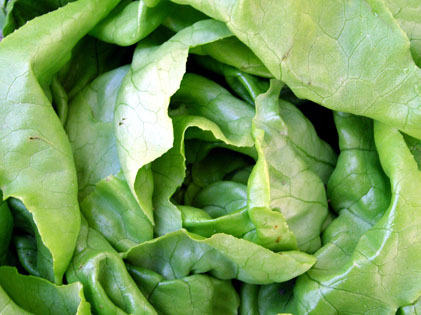 How cold can lettuce stand in the spring when nights get cold yet? Can they stand under 20 F temperatures? wonderful site! this is my first time planting lettuce. i planted my seeds on a nice 60 degree day, we then have had a cool snap with highs in the low 40’s and overnight lows in the 20’s/30’s. it’s been a week or so now and nothing’s come up. will i have to plant again or just keep waiting? Hi! I live in Sacramento, California. I have a small plot of soil (8’x3′) that unfortunately, gets shade for most of the day. Is there any lettuce variety that can be grown with a minimum of direct sunlight? Great site. It was alot of help for first time grower. Thanks in OKLA.
hello I live in Tucson, AZ. I started my vegetable garden almost a month ago and everything came up just fine. The problem is that I came out this morning and something was eating on my lettuce apparently in the middle of the night. It looks like something took the lettuce off to the ground. Any idea of what could be doing this, and what i can do to stop it. Thanks for your time. Here is a good page that describes common lettuce pests in Arizona. It sounds from your description that it might be something larger than a bug though. Rabbits or rats? Is there a certain type of soil that butterhead lettuce should grow in? Yes, I’ve seen that before. You can always just nibble the leaves and check and make sure they’re okay. Living in CT what is the best way to start lettuce? The lettuce I planted in my raised box is growing like fur in it? Around the stems??? Every day, I find another oakleaf lettuce plant lying on the ground, the stem almost cut clear through. What is doing this? Would it be cutworms? How do I deal with them? IS there an organic solution? I have great luck with Spinosad based organic products. They work on a wide spectrum of insects and caterpillars. http://www.cleanairgardening.com/spinosad-yard.html This one says yard, but I use it on my garden. http://www.cleanairgardening.com/organic-slug-bait.html This one says slug bait, but it really helps with just about anything crawling on the dirt, and it mentions cutworms. They are really the same active ingredient in two different forms. One of them lets you water it on. The other lets you sprinkle it as a solid. As a first time lettuce grower, how do I know when to pick the lettuce. Can we pick leaves at a time for use or do we have to harvest the whole head? It depends upon which type of lettuce. A friend of mine started a very small garden patch in the middle of May, even though neither of us have ever grown veggies before. I put in 4 tomato plants, and she put in 2 crookneck squash plants. Everything is growing beautifully so (knock on wood), but it turns out that she doesn’t like crookneck squash (!) and wants to plant lettuce instead. We live in California on the central coast (Santa Barbara) and have had foggy mornings for the past month or so, but that’s starting to end. The plot gets some shade in the afternoon from a large tree, but plenty of sun in the morning and later afternoon. The main question is timing – is it too late, or would she have success by starting over now? Thanks for any advice! I am trying to grow solid head lettuce. It never forms heads though. I am trying to grow iceberg. higher and then goes to seed. If it is too hot here (PA) can you recommend a leaf lettuce similar in flavor that I can substitute. So there’s a debate I’ve got among some friends. We’re trying to agree on how much nitrogen (e.g., ppm of Nitrate) is needed to grow a single head of 60-day lettuce, or a sq. area of lettuce from seedling to harvest. Yes, I realize that the variables in assessing this are broad, but would you have a guesstimate? My lettuce has been doing SOOO well all spring/summer until about a week or two ago. They aren’t growing back like normal. The leaves are wilted and droopy. The stalks are big and thick and instead of the leaves growing full and bushy like before they are just “blah.” Not sure what is going on. We have soaker hoses in the garden that water morning and evening. we are trying to grow lettuce on a large in our greenhouse at school and i was wondering if you had any tips on how to set it up like would we have to remove our large wire tables? Or could we use them to grow. Any tips would be very helpfull, thank you very much. Should I remove the existing leaves at this time? I’m in south Ga. I planted my lettuce in late Sept. and they look great. but now they are calling for frost. temps in the low 30’s should I do anything to protect them or will they be fine? hi, i have a question. I’m doing a school project on plants, and I was interested in doing it on lettuce. i know that plants take nitrogen from the soil to create proteins, but if there’s too much CO2 in the air, they take more of that and less nitrogen which leaves the plant less nutritious. I’m just wondering if lettuce has the same process of making nutrients..it IS a plant, but i just want to make sure..
It’s be a great help if I got a reply ASAP, the project is due in a couple of days. We were wondering if it is possible to replant the root from purchased butter lettuce? I think not but my wife wants to try. How much water do you think it takes for each head of lettuce in a greenhouse with recycle systems? I have a very small garden with limited space to plant lettuce. It sounds like there are some types that will keep growing (you remove the outer leaves and the plant continues to grow more leaves); could you tell me which types these are? I just don’t have the space to plant numerous plants. In the lettuce articles, I don’t think it mentions that lettuce seeds require light to germinate, right? This was important to me when I read about it on the back of a pack of seeds and it’s not on most packs of lettuce seeds.